Angela Wilson lead a mindfulness training session with employees from Clinical & Support Options in Pittsfield. The lights are dimmed and a handful of women sit with eyes closed, hands on their knees. “Allow both of your shoulders to simply drop, soften, letting them become almost like putty,” Rana Chudnofsky says in dulcet tones that could make even a chronic insomniac drowsy. Chudnofsky, education director of the Benson-Henry Institute for Mind Body Medicine, exhorts them to think “I am” as they inhale and “letting go” as they exhale. This isn’t some New Age spa or retreat. It’s lunch hour at Massachusetts General Hospital, and outside the closed doors of the small auditorium flows a steady stream of intent activity: patients on walkers or in wheelchairs; anxious family members; doctors and nurses in scrubs. Once a week, to ease the stress of working at one of the nation’s busiest hospitals, Mass. General offers its employees, from maintenance staffers to surgeons, meditation classes. As employers look for ways to ease the anxieties of overworked employees, workplace mindfulness is spreading from Silicon Valley campuses to old-school corporate America, with Fortune 500 companies like Target, Nike, and General Mills joining tech giants such as Google, Apple, and Intel in offering meditation and yoga classes, nap rooms, and mindful eating. Professional sports teams use mindful techniques, and there are even some group meditations on Capitol Hill. In the corporate setting, the mindfulness movement is purportedly about changing the culture so that both employee and employer can better contribute to the well-being — physical, emotional, financial — of one another. Simply put, it’s supposed to make the office a nicer place. But a major motivation is the bottom line. The World Health Organization estimates that stress-related maladies cost US companies at least $300 billion a year in absenteeism, turnover, diminished creativity, and productivity. Dr. Darshan Mehta, medical director at Mass. General’s Benson-Henry Institute (established in 2006 with the support of John Henry, who has since become the owner of The Boston Globe), has seen both aspects. Mehta notes that regular mindfulness practices — meditation, yoga, tai chi among them — have been shown to boost physical and mental health by reducing stress and lowering blood pressure and heart rate. 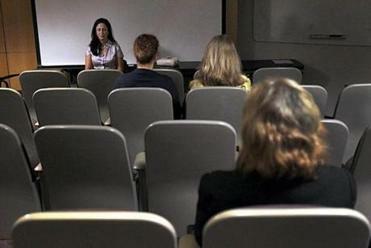 A lunchtime mindfulness class was held at Massachusetts General Hospital. But Mehta, who has done mindfulness consulting with companies in the Boston area, says that firms are pleased that staffers are calmer and healthier, but they also want greater productivity. “An increased sense of well-being means that people will actually show up for work,” says Mehta. In 2010, Aetna, the Hartford-based health insurer, rolled out free yoga and meditation classes, both online and on site. So far, more than 13,000 of Aetna’s 49,000 employees have participated. In Massachusetts, Aetna has about 500 workers. Participants have reported deep decreases in stress levels and sleep problems and regained 62 minutes per week of productivity, which translates to a return of more than $3,000 per employee per year, the company says. At Google, which has a Kendall Square office that employs about 1,000, classes in Meditation 101 are offered, along with mindfulness-based stress reduction, yoga, mindful meals, and daily meditation sits. What exactly is mindfulness? Mindfulness involves being relaxed yet observant of what you see, hear, and feel — especially of your own breathing. Kabat-Zinn was a graduate student at MIT in 1965 when he began a lifelong love affair with meditation. Later, at the University of Massachusetts Medical School, he developed Mindfulness-Based Stress Reduction as a way to treat patients in stress and pain. 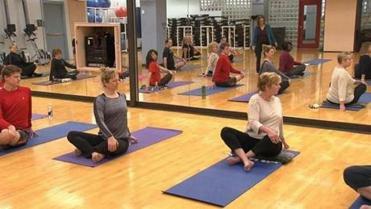 Aetna employees participated in a yoga class at the company's Hartford, Conn. headquarters. But not everyone is a true believer. Dr. David Brendel, a Boston psychiatrist and executive coach, (www.leadingmindsexecutivecoaching.com) says that “a cult of mindfulness” in the workplace could actually replace more tangible employee benefits. The Huffington Post, long labeled a low-paying, high-stress place by some employees, could be Exhibit A. Its leader, Arianna Huffington, saw the light after she collapsed from exhaustion. In 2014, she wrote “Thrive,” a self-help book about turning away from money and power and toward serenity. She installed nap rooms, hammocks, and breathing classes in the office. Edi Pasalis, director of the Kripalu Institute for Extraordinary Living in Stockbridge, the largest yoga education center in the nation, says that workplace wellness is still in its infancy. “Mindfulness training is still ancillary, but leading-edge companies are starting to build it into their core operations,” she says. For example, at Eileen Fisher womenswear, a chime is rung before each meeting and participants sit in silence until the sound fades. “It embeds this moment of recentering into the context of the day,” Pasalis says. Her institute has researched the impact of its yoga classes and meditation training at schools, hospitals, companies, and prisons. “What happens over time is that the actual culture of the organization changes to one that is more positive, easier to work in,” Pasalis says. Brendel agrees that professionally led volunteer sessions can be beneficial. But he cautions that when companies require attendance, either implicitly or explicitly, they can actually increase stress.